My very first job in journalism was to write feature stories about the Bruce Peninsula for the local tourism organization sometime around the year 2001. It was a student’s dream job: all kinds of latitude and time to write about the beautiful land I grew up in. I learned how to generate stories, how to interview, how to use the inverted pyramid, and I realized that writing, a thing I loved, could become a path to a career. My editor was Phil McNichol, a retired journalist from the Owen Sound Sun Times. He would land in the office with his dog and a straw hat, and cut through my writing with a red pen. It hurt, but it was a necessary pain. I had to learn that I may have been a decent writer, but I had a lot to learn. I could always get better. We grew quite close that summer, as he figured out I had thin skin but someone with passion and a drive to make a difference. I started thinking about applying to journalism school. But he warned me, clear as day: Journalism can be amazing, but hard. It can be a grind. It’s not your job to make friends. The pay isn’t great, and you put in way too many hours with no thanks. It can take over your life and use up all your head space, hurting your personal relationships. I heard him, and I felt a little concerned. But I grew up on a farm, and all of it sounded vaguely familiar. On a farm, there is no such thing as 9 to 5. Stress is a given. Hard work is valued. Because what you do is important. It has meaning. And money isn’t everything. Still, I wasn’t sure I was cut out for journalism, especially in the big city. So I went to Wilfrid Laurier University and took Communication Studies. I got involved in the Cord, the student paper, and quickly got addicted to the news business. I was proud of the fact that I pulled all-nighters every week on production night. I loved running out of class to get an all-important interview with the university president. I loved challenging norms and asking tough questions of the student union. There was nothing like seeing people reading my articles in the student lounge. This felt like the most important, meaningful work I could pursue. I went on to study journalism at Western, and eventually got intern work at a handful of southern Ontario dailies. In 2009, when the Waterloo Region Record went through a series of lay-offs, I was not spared. Desperate to stay in the business, I sent my resume across Canada, and ended up getting a summer internship at the Telegraph-Journal in Saint John. I drove 1,600 kilometres in a 1997 Volkswagen Jetta, bringing two cats and a few belongings (including a vacuum and my Canadian Press Style book). I found a furnished apartment and thought I’d give it a go here, for $12 an hour. It was the right time in my life for a big change. Before long, it felt like home. Over more than six years, I’ve had the privilege to follow many stories, big and small. I’ve written about everything from stray cats to crime and city politics. I’ve interviewed mascots and premiers and war veterans and police. I’ve laughed and cried with my interview subjects. I’ve convinced them to tell me their stories, their secrets, their frustrations and fears. Having the chance to craft and share these stories has been a true honour. But life happens, and times change. I still love journalism. I believe in its power to provoke, move and entertain. Community journalism is particularly important as the world gets smaller, and the channels of communication become more cluttered. We need a way to make sense of our world, and our place in it. Yesterday morning, I clicked on my voice recorder and flipped to a clean page in my Telegraph-Journal notebook for the last time. It was a fairly typical day, but I find it fitting that my last interview as a city hall reporter was with the mayor. In my new job at AdvocateDaily, I will still be writing and interviewing experts on a variety of legal topics. I’ll be building sources in a new way. But I will no longer be a newspaper reporter – something I once believed I was destined to do for a very long time. Still, I’m thrilled to have a new opportunity at my feet. A chance to build new skills and put my existing ones to the test. I’m ready for a change. To everyone at the Telegraph-Journal and throughout Greater Saint John, please know I am forever indebted to you for welcoming a girl “from away” and accepting her as your own. For allowing her to participate in the community from such an incredible standpoint. For allowing her to ask questions and trusting her with your words. Lucky for me, I got to tag along with my husband and friends who ran the St. Andrews road race. Once again, I was in the cheering section, watching my baby daddy gallop along the pretty streets of St. Andrews on the Passamaquoddy Bay. 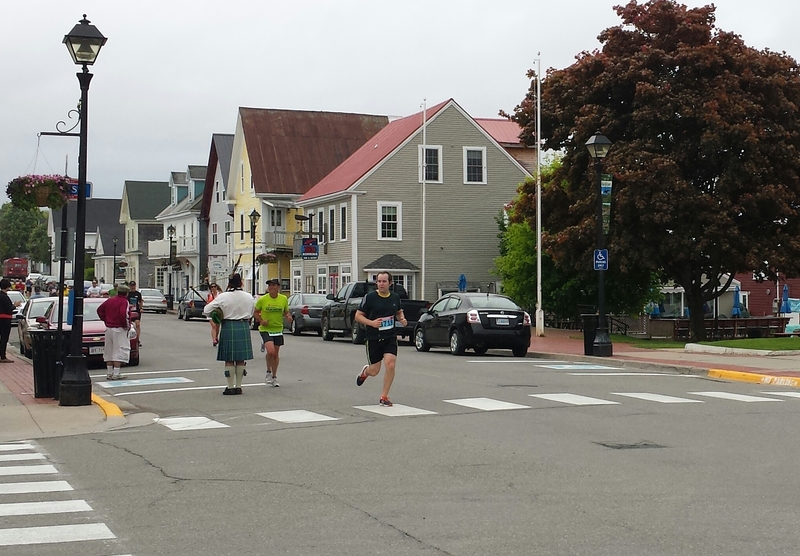 A bagpiper serenades runners along Water Street in St. Andrews. It appears to be a challenging course, with a “lung-burner” hill near around the fourth mile. It was also slightly windy, misty and humid on Sunday, making for less-than-ideal conditions. Still, it was fun to be apart of the event, watching friends make that awe-inspiring run toward the finish line. Just another bit of inspiration for me to get back at, hopefully a few weeks after our baby is born toward the end of June. The Bay of Fundy Marathon just sounds cool. I want to add it to my running bucket list. When else could you cross an international border over the course of a run? It’s a Boston-qualifier, includes a 10-K, and seems to cover a picturesque course between Lubec, Maine and Campobello Island, NB. One to mark on next year’s calendar, for sure. As for the Moncton run, an estimated 7,000 people showed up on Sunday to walk, run and cycle, raising an estimated $100,000 for the fallen Mounties’ families, according to media reports. I – like many New Brunswickers, and indeed Canadians – felt deeply impacted by the Moncton shootings. I wrote stories from the Saint John newsroom (only about an hour away), including on my last day of work before maternity leave, when I co-wrote an obituary piece on Const. Doug Larche, one of the three slain officers. As well as a treasured father, husband and police investigator, Larche was a runner. He landed a personal best half-marathon time in Fredericton this spring at 1:41:40 (an impressive time, considering many runners, including me, struggle to get under the two-hour mark). Just another reason why these shootings still feel close to home.